The blue-winged warbler (Vermivora cyanoptera) belongs to the family of New World warblers, the Parulidae. 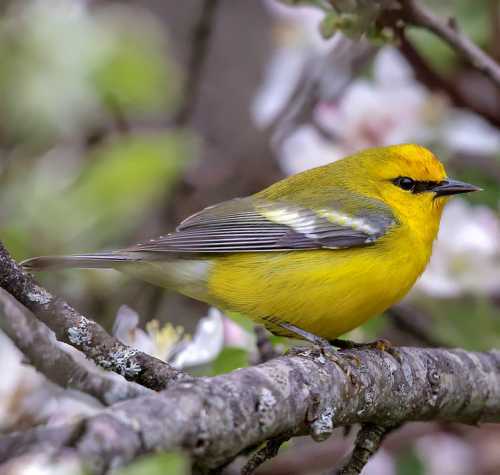 The blue-winged warbler is distributed in Canada, USA, Mexico, Belize, Guatemala, El Salvador, Honduras, Nicaragua, Costa Rica, Panama, Colombia and Caribbean Islands. These warbler species are fully migratory. These warblers are monotypic species. The blue-winged warbler (Vermivora cyanoptera) is a small warbler, measuring 10 to 12 cm in length and weighing 7 to 11 grams. The male blue-winged warbler has bright yellow head, throat, breast and underparts. The nape, flanks and the upperparts are olive green. The wings and tail are pale grayish blue. The wings have two white patches. There is a black eye stripe. The female is duller, with less yellow on the crown. The juveniles are olive green with pale grayish blue wings. The bill is sharp, pointed and dark gray in color. The short legs and feet are flesh colored. The irises are blackish. There is a yellowish eye-ring. Their call is a series of buzzing notes and a sharp "chipp" sound. The blue-winged warbler is distributed in southeast Canada, eastern USA, Mexico, Belize, Guatemala, El Salvador, Honduras, Nicaragua, Costa Rica, Panama, Colombia and several Caribbean Islands. These warbler species do not normally occur in forests. They normally occurs in altitudes between 0 to 100 meters. The natural ecosystems and habitats of these species include temperate grasslands, temperate shrublands, edges of forests, clearings in forests and neglected fields with scrub growth. 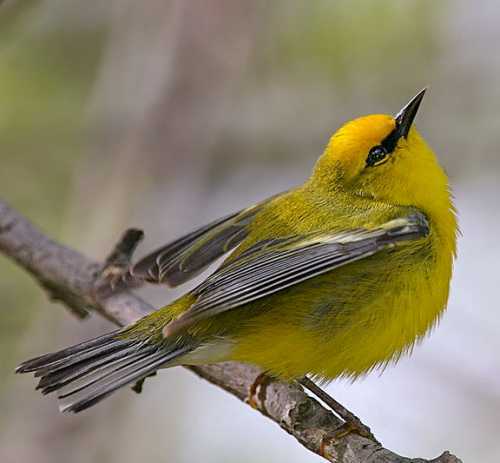 The diet of these blue-winged warbler species consists mainly of invertebrates. Insects, insect larvae, caterpillars, beetles, crickets, grasshoppers and spiders are their primary food. They forage on the ground and in bushes. The breeding season of these warbler species is from May to July in most of their breeding range. They are monogamous and solitary nesters. They nest on the ground or on low bushes, hidden from predators. The nest is a cone-shaped cup, built with leaves, bark stripes and plant fibers. It is lined with feathers and fine rootlets. The clutch contains four to six eggs. The female warbler incubates the eggs. The chicks hatch out after 10 days of incubation. The hatchlings are altricial, depending completely on parents for brooding, feeding and protection. They fledge after 10 days. These blue-winged warbler species are fully migratory birds. The breeding populations occur in northeast USA and southeast Canada (Ontario and Quebec provinces). Populations under migration are found in southeast USA. They leave breeding grounds during August to winter in southeastern USA, central America, Colombia and Caribbean islands. The return migration to the breeding grounds takes place in early summer. The global population size of the blue-winged warbler (Vermivora cyanoptera) has not been quantified. The overall population trend of the species is reported to be decreasing. In most of its range, this species is reported to be fairly common to common. The generation length is 3.7 years. Its distribution size is about 2,040,000 sq.km. 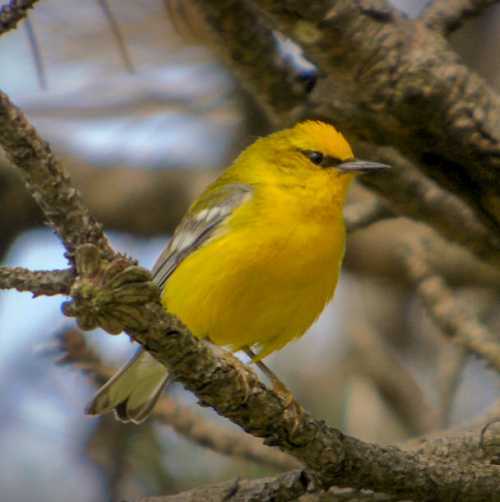 Ecosystem degradation, ecosystem conversion and trapping of adults and juveniles for pet-trade are the main threats that may endanger the survival of the warbler species. The blue-winged warbler (Vermivora cyanoptera) species does not approach the thresholds for being Vulnerable either under the range size criterion, or under the population trend criterion or under the population size criterion. The CITES (Convention on International Trade in Endangered Species of Wild Fauna and Flora) status is ‘Not Evaluated’ for the blue-winged warbler (Vermivora cyanoptera). The blue-winged warbler (Vermivora cyanoptera) is closely related to golden-winged warbler (Vermivora chrysoptera) and forms two distinctive hybrids with V. chrysoptera. Recently updated and current topic in American birds: Blue-winged warbler - Vermivora cyanoptera.